Your Tuesday Night Just Got Infinitely Better: Farnetella's Super Tuscan for $11 Bucks! There’s a sort of holy grail in the wine world. I’m not talking unicorn wine—that rare, ethereal beauty that you only get to try once in your lifetime and that buys you extra wine-geek points. And I don’t mean the high-roller wine that HAS to be good because it’s got all the pedigree, scores, and financial backing behind it. I’m talking the super-solid super-value everyday wine—the one that surprises you with how good it is because of how little you spent. The one that really delivers on a Tuesday night after you’ve put the kids to bed and turned on Netfilx and finally get a moment to relax. The one you can afford to drink even during Rent Week, when, let’s face it, you probably need it most. The one that reminds you that wine is a food, not a luxury item (necessarily), and it can be damn honest and damn good. 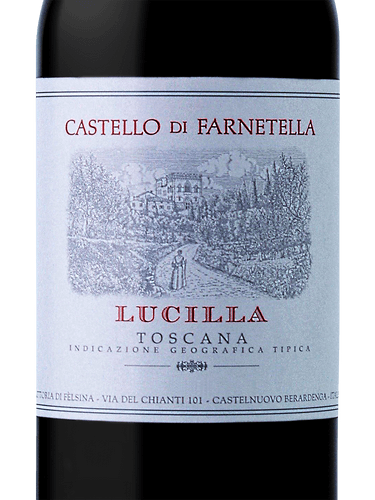 The 2016 Farnetella Lucilla Toscano Rosso hits all those boxes. It’s a delicious wine—notes of deep red fruits with underpinnings of herbs and earth, plus great acidity and structure to stand up to your takeout pizza. But did I mention it’s $10.99? Friends, it’s $10.99. Don’t get me wrong, there’s pedigree here, too. Farnetella is owned by the Poggiali Family, who also own one of our staff favorites, the Fèlsina Estate. And it’s got the terroir—located in the Chianti Colli Senesi zone, north of Montalcino and bordering Vino Nobile di Montepulciano. It’s got the scores (91 points James Suckling). Plus, Castello di Farnetella has all the romance you’d want in a Tuscan winery: a Medieval castle filled with frescoes, antique furniture, and carved woodwork; rolling hills of vineyards and oak trees and olive groves poised on a sunny plateau above the village; a history that dates back to the 5th and 6th centuries. But when it’s Tuesday night, what you need to know is this: Farnetella has got what you need—and it won’t break the bank.